its a good standard race attracting club runners from as far as Gateshead and even Sunderland, and as befits a previous home of Dame Danni Gray-Thomson even has a wheelchair race. The route delves into the industrial past of the area, running down the main road that separates the petrochemical industry on one side from the Steel industry on the other……but its a bit boring and you just turn around a roundabout and go back on yourself, through the start again [a la Barns Green] and then along the seafront along to Marske, the next town, where again its a U-turn and back on yourself [yawn!]. Fabulous weather made it a great day. I was running with my niece Debbie and her partner Alex, neither of whom is an experienced runner so my role was simply to support and encourage [and Alex carried not one but two injuries that forced him to drop out midway – amusingly as he walked back to the start area his chip was triggered and he received an official finishing time ahead of us! I must remember that one]. We were running in support of Parkinsons though so the pain Debbie felt was overshadowed by the £1k we raised to a very good cause. 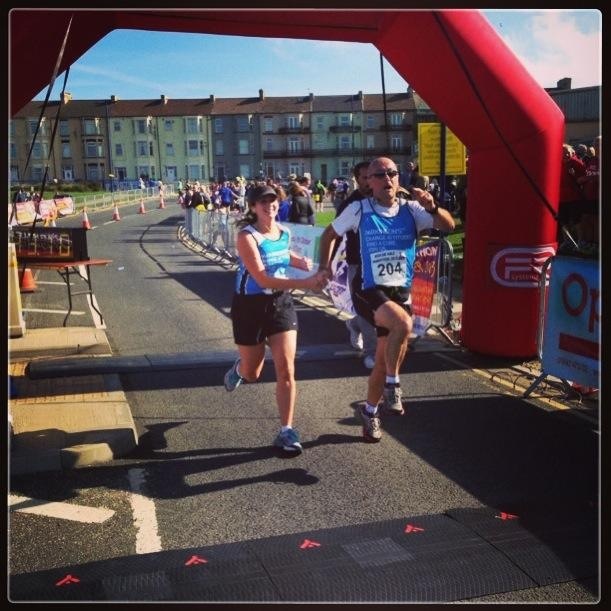 For me a PW (Personal Worst) of 2:42 but Debbie was truly happy to finish and not walk, and that made it all worthwhile. Plus I had a whale of a time in the sunshine and all the marshalls were absolutely brilliant and shared a lot of craic. I think I may do this again!